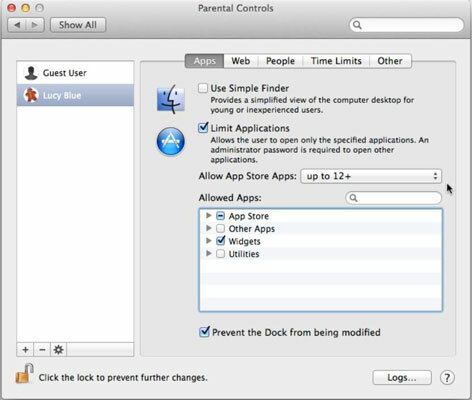 You may want to use Parental Controls on your Mac not only to protect your children from seeing things they may not be mature enough to see, but also to restrict what guest users can do with your Mac. You apply limits or restrictions to a Managed with Parental Controls account even if the person who accesses that account isn’t your child. Apps: Limits the apps the user may use and offers an option to simplify the appearance of the Finder. Web: Limits which websites the account can access. People: Limits the account to sending and receiving e-mail and instant messages from a fixed list of approved people. You can also receive an e-mail when the user tries to exchange e-mail with a non-approved contact. Time Limits: Prevents someone from accessing the account at certain times or on certain days. Other: Select the associated check boxes to hide profanity, prevent modifications to the printers connected to the Mac, prevent saving data to a CD or DVD, or prevent changing the account password. Choose Command→System Preferences and then click the Users & Groups icon. Click the lock icon and enter your password to unlock the Users & Groups System Preferences. Click the Parental Controls button. 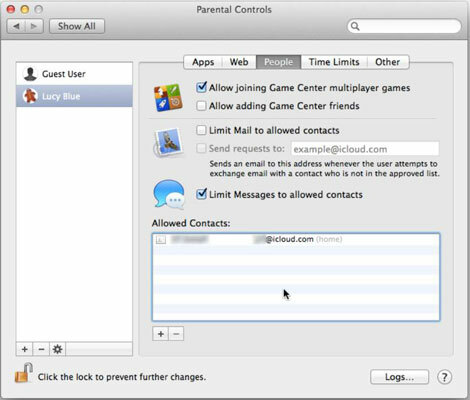 The Parental Controls preferences window opens. Click the account to which you want to apply Parental Controls. Click the Apps tab (if it isn’t already selected). The Apps preferences pane appears, as shown in this figure. Use Simple Finder: Select this check box to create a Finder that’s easier for novice Mac users to work with. Allow App Store Apps: From this menu, choose a specific age limit for the types of apps the App Store shows. Allowed Apps: Click the gray expansion triangle to the left of each Allowed Apps category to display a list of apps on your Mac for the selected category. Select or deselect the programs you want to allow or disallow the user from accessing. Selecting or deselecting the check box for an entire application category, such as App Store or Utilities, gives you a single-click way to allow user access to all or none of the programs in that selected category. A dash in the check box means that some of the apps within that category are selected, and the user is allowed to use the checked apps. Prevent the Dock from Being Modified: Choose whether this user may modify the Dock; this option isn’t available if Use Simple Finder (earlier in this list) is enabled. Click the Web tab to open the Web preferences pane, as shown in this figure. Allow Unrestricted Access to Websites: Allows users to access any website they want to visit. Try to Limit Access to Adult Websites Automatically: You can click the Customize button so that you can type the websites the account can always access and the websites that the account can never access. In both cases, you must type the address you chose to allow or block. Allow Access to Only These Websites: You can then specify which websites the user can access by clicking the “+” (plus-sign) button and adding websites you permit the user to visit. You can also remove websites you no longer want guest users to access by clicking the website in the list of allowed websites, and then clicking the “–” (minus sign) to remove the website. Game Center: Controls multiplayer games and/or adding friends. Limit Mail, Limit Messages: Select one or both and click the Add (+) button under the Allowed Contacts box to open the dialog that allows you to add specific names or groups, as shown in the following figure. Enter the first and last name of a person that you approve of into the First Name and Last Name text boxes. Access your Contacts by clicking the triangle to the right of the Last Name field. Select multiple addresses by holding down the Command key. Enter an e-mail or IM address of the approved person in the Allowed Accounts text box. 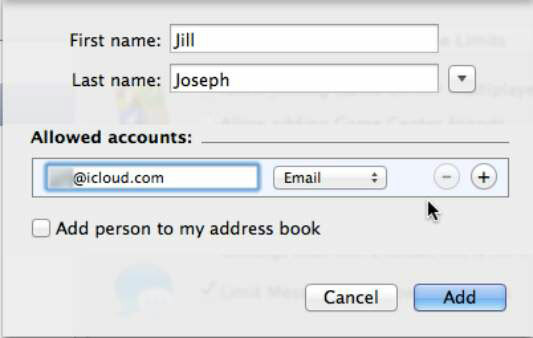 Choose the account type (Email, AIM, or Jabber, for example) from the Allowed Accounts pop-up menu. Select the Add Person to My Address Book check box, and the IM address and name of the approved person will be added to the Contacts app. (Optional) Click the “+” button to specify another person and the associated e-mail or instant messaging chat account address. The dialog closes, and the names appear in the Allowed Contacts list. If you want to remove someone from the Allowed Contacts list, click the name and press the Delete key or click the “–” button. Click the Time Limits tab to open the Time Limits preferences pane, as shown in this figure. Click the Other tab to open the Other preferences pane. Click the lock button at the bottom left of the window, and then click the Close button to quit System Preferences.